Biodynamic and low SO2 wines from the Spanish island of Mallorca. Pronounced “peek-pool de pee-nay,” Picpoul de Pinet is a designation or cru which may be used within the Languedoc appellation for white wines made exclusively from Piquepoul blanc from six communes: Pinet, Mèze, Florensac, Castelnau-de-Guers, Montagnac and Pomérols. South of Montpellier not far from the border with Spain. Little known fun fact: Picpoul de Pinet, along with Claudette Blanche, are the primary varietals used in the manufacture of Noilly Prat, the well-known vermouth. Little known fun fact #2: Both the blanc and noir versions of Piquepoul are permitted blending grapes for the production of Châteauneuf-du-Pape. Christelle & Mathieu Caron are located between the Mediterranean Sea and the Cevennes region, along the Bassin de Thau.The domaine is situated on the edge of the route from Castelnau de Guers to Pinet, five kilometres from the sea, along a road sided by old pine trees which lead to the estate of La Grangette. The buildings of the Domaine are grouped around the house, typical in style of a Languedoc mas or farmhouse, sheltered from the north winds by tall, densely planted pines. The Domaine stretches over 60 hectares which includes 10 hectares of pine forests. 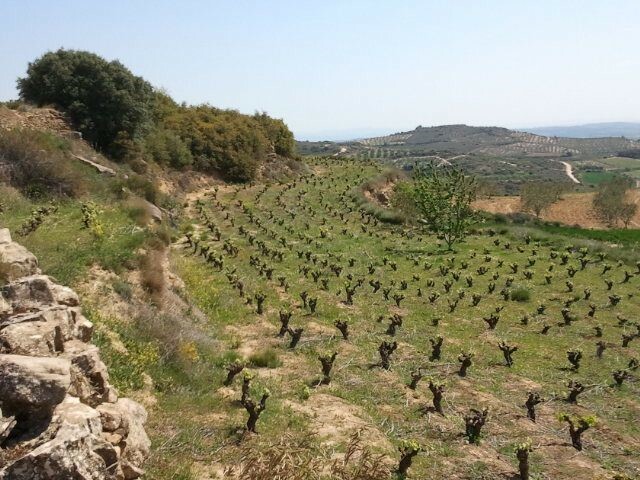 The terroir originates from old lakes and seas and is composed of hard and soft limestone. Of the 50 cultivable hectares, 40 are actually planted with vines, of which 10 are new plantings. The vineyards are divided equally between a zone of deep alluvial soils and the other of hillside and garrigue classified as terroir A.O.C. Picpoul de Pinet. The remaining 10 hectares are planted to cereal crops. The domaine practices sustainable agriculture, and the philosophy is to work organically allowing the regeneration of the soil with ground cover in between every other row to decompress the ground after harvest, digging in the cuttings after pruning in winter and then mechanically cleaning and rotating the soil at the end of July. From a 10 hectare plot of Picpoul grapes that were planted 12 years ago to clay/limestone soils and yielded 30 hectoliters per hectare. Fermented in stainless steel for one week followed by aging 4-5 months in stainless steel tanks before being bottled. From 15 year old vines of the very rare Piquepoul Noir, planted to clay/limestone soils. This wine was macerated for 21 days in stainless steel tanks followed by an additional 4 months of aging in tank. The resulting wine is bright on it's feet with aromas of strawberry and pink peppercorns. Medium bodied and medium colored, this is a distinctive rose that is set apart from the vast oceans of sameness. From a 2.4ha vineyard of Piquepoul Noir planted to clay/limestone soils. The average age of the vines are 15 years old. Sustainable, moving to organic vineyards. Light pneumatic pressing followed by a 15 day maceration/fermentation in stainless steel tanks. The wine was then racked and aged an additional 4-5 months in stainless steel.